The Blackville community has now joined Mullaley and Bundella in declaring itself CSG free. A fantastic 96.9% of residents voted in strong support of living in a CSG free community. Other communities on the Liverpool Plains are enthusiastically working towards achieving this aim and results will be posted soon. This is a strong message to the State Government and local council. Many thanks to Megan Kuhn who oversaw a team including Sue and Margie Wilmott, Nicky Chirlian, Barbara Ward, Julie Prowse and me. The Community Blockade was removed from the Glasserton site near Spring Ridge on the 15th November 2011. The blockade included 24-7 coverage for 19 days. This coverage certainly couldn’t have been possible without the wonderful support from the local community and beyond. CCAG received a number of requests from concerned citizens throughout the State offering their time to assist at the Community Blockade. On the first weekend of the Blockade a couple travelled from the coast for the weekend to support the community and make a stand against Coal Seam Gas (CSG). Thank you to all of you for giving your time to support this community event. 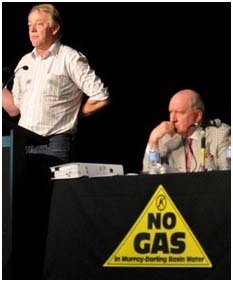 “The Government is broke and they don’t give a stuff about the Farmers”…..
That was how broadcaster Alan Jones concluded the Food Forum held at Gunnedah Town Hall on the 12th October, calling on more people to protest and said “it was up to us to fight for food security”. The National Day of Action on the 16th October united Coal Seam Gas groups all across Australia. The first day of National Water Week was chosen as the rally day for maximum impact. Over 10,000 people, in groups from 50 to large rallies of 2000, gathered to show their support for stopping irresponsible mining destroying farm land, precious food resources, underground water systems and natural environment. SOS Liverpool Plains organised the local event at Willow Tree Park with over 60 community members protesting against CSG. Many travellers called into the stand, with questions about the risks posed by the CSG industry, with concerns about how the NSW Government could jeopardise an area that produces so much food, and put at risk our children’s future environment. Over 100 Farmers were present on Thursday 27th October to launch the community blockade to stop Santos from commencing CSG pilot production at George’s Island Spring Ridge. The second day brought another 90 people to show their support. Our Farmers should be growing our food not manning blockades but the community feel they have no other choice. They are committed to protect our most valuable resources and it is a credit to them.